They do not use United States legal tender currency and coin like the rest of us, instead they use gold as money. They call their money gold dollars, and designate them so: G$. How very quaint. Monetary-Amish folk. Financial Luddites. Amazingly, wages and prices have not risen in Freedom during the past 50 years. People still grind out a week of work today as they did half a century ago, still for about G$100. Of course, a loaf of bread costs G$.19 and a brand new car can be purchased for G$2,000. I recently spoke with a long-time Freedom resident, and the subject of the '70s came up. I couldn’t believe how different our memories were of that decade. I remember the oil embargo, gas shortages and skyrocketing pump prices. I remember gas stations having to charge by the half-gallon because the pumps could not register gallon prices above 99.9¢. And beyond gas and oil, I remember inflation: Remember Ford’s WIN buttons? Whip Inflation Now. We were at war with a mysterious, powerful, invisible and destructive enemy. If we turn back the clock 50 years, we see that the gold money used by the good citizens of Freedom was identical in value to the money used by the rest of the United States citizens. If you had 1/35 of an ounce of gold, then by definition you had a dollar. They were one and the same. Equal. Identical (I know, but since we’re pretending here, let’s pretend that American citizens 50 years ago could actually legally possess gold and their currency was in fact redeemable in gold.). Whether you lived in Freedom and used gold, or whether you lived anywhere else in the United States and used American currency, the price of a gallon of gasoline (the price of which is strongly correlated with the price of oil) was the same for everyone. But then something momentous happened: American currency became disconnected from gold. The residents of Freedom now had a monetary system that had nothing to do with the legal tender fiat monetary system used by the rest of the country. Beginning in the '70s outside of Freedom, the rest of the country became accustomed (desensitized) to rising wages and rising prices that were the hallmarks of an elastic (inflationary) monetary system. Heaven knows what would happen to the economy if there weren’t enough legal tender in circulation! The Federal Reserve was therefore given the all-important task (monopoly power) of making sure there was enough to go around. Since Freedom’s monetary system was not part of the Federal Reserve’s concern, these unfortunate (fortunate) people were unable to benefit from the Fed’s munificence (machinations). The following chart illustrates the long-term record of the two different monetary systems with respect to the price of oil. Back in 1970, everyone in the United States, the State of Freedom included, was paying about $3.30 for a barrel of oil. 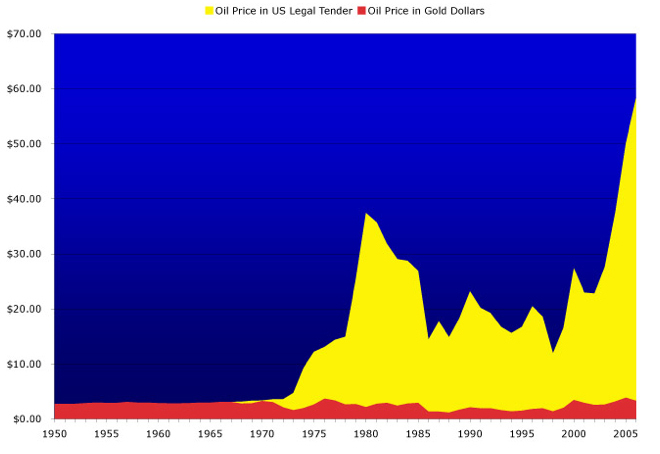 The oil shocks in the '70s sent the US legal tender price rocketing to an annual average of over $37.00 in 1980, but amazingly (there’s that word again), Freedom’s annual average cost for oil in that year was G$2.17 (fully one-third lower). The highest and lowest annual average cost for a barrel of oil in Freedom during the '70s was G$3.70 and G$1.64, respectively. Perhaps more incredibly, the average annual cost of a barrel of oil today (2006) is upward of $60.00 a barrel (with current prices over $75 a barrel) but still holds at a bit over G$3.00 in Freedom. The annual average cost of a barrel of oil in Freedom has never exceeded G$4.00. Somehow, the state of Freedom has avoided the oil shocks that the rest of us have suffered through in this country. How is that possible? A set number of available dollars and a set quantity of available oil set a market price for oil. If the supply of oil drops, the ratio of dollars to oil rises, and so the market adjusts the price upward. A set number of available dollars and a set quantity of available oil set a market price for oil. If the supply of money rises, the ratio of dollars to oil rises, and so the market adjusts the price upward. So which of the above cases best describes what caused oil prices to rise dramatically throughout the '70s: A shortage of oil or a surplus of legal tender dollars? Well, there are two strong points for the case that claims that a surplus of dollars, not a shortage of oil, was the main culprit. Point number one is that the price of oil in the State of Freedom did not increase, even though it had the same oil supply access as the rest of the country. If an oil shortage existed, then the price of oil in gold dollars would have risen in the same manner as it did in legal tender dollars. 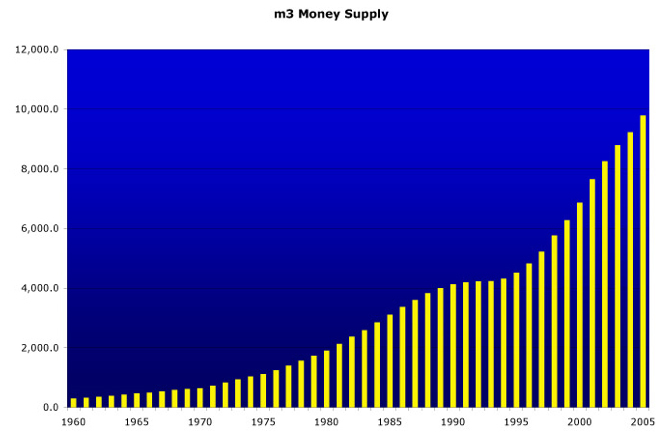 In the '60s and '80s, the M3 money supply roughly doubled in each of those decades, while it tripled in the '70s. This represents an M3 money supply increase rate in the '70s that was twice as rapid as in the preceding and following decades. This rate must have greatly outpaced the growth of the economy, hence the observed '70s inflation. Remember, just like in the oil market case we looked at earlier, if there is an increase in the amount of dollars in the “U.S. economy” market relative to the goods available, then prices will rise. This is not due to shortages, but to the decrease in value of each dollar due to the increased supply of those dollars. Here we have arrived at the true definition of inflation. It must be viewed as a devaluation of the monetary unit, not an increase in value attributed to the goods purchased with said monetary unit. The above chart shows the inflation-adjusted (2006 legal tender dollars) average annual historical price of a barrel of oil over the past 50-plus years. We can calculate that the average price over this span of years is about $31.50 a barrel. Before the jump in price that began in the '70s, the average price was slightly less than $20.00 (when it was equal to Freedom’s gold dollar), so we see that on average over the last 35-plus years, Americans outside of Freedom have paid some 60% more per barrel of oil than their counterparts within. And keep in mind that the CPI index used to calculate these inflation-adjusted prices excludes energy and food costs. When you consider, even as you read these words, the costs of energy and food are rising at a rate that far outpaces the items used to calculate the CPI index, and you consider that most families spend a considerable percentage of their income on food and energy, then you can see that calling the inflation-adjusted pricing based on the CPI index conservative is being quite charitable. But you know what? Even if every single person in the population is able to keep pace with inflation, inflation still robs them of their savings. Every dollar set aside as savings erodes into a fraction of its original value as time passes. It is nothing less than a theft of each and every person’s property. Now I must address one more point before wrapping this up. The fact of the matter is that in the 1970s, there were long lines at gas stations and at times the stations ran out of gasoline. Contrary to the above proposition, that prices rose due to an increase in the money supply, this evidence tends to support the idea that a shortage of gasoline caused the increase in prices, and this is the popular belief. But the shortages were in fact artificial and were caused by government intervention in the form of price controls. There were minor supply cutbacks by OPEC, but these events were not allowed to naturally cause a gradual rise in prices, which would have encouraged oil companies to produce more and would have encouraged consumers to buy less. Instead, price controls were instituted, keeping the prices artificially low. Producers had no incentive to produce more, and consumers flooded the market to buy as much as they could of the below-market cost product, fearing that the highly-publicized shortage might leave them without a means of transportation. Gas stations often only had to stay open a few hours a day to empty out their tanks, and because they could not raise prices, they closed down after selling out their gasoline in order to hold down labor and operating costs. So by not allowing prices to rise in order to reach the proper market-clearing price, the government’s artificially-created low prices caused consumers to buy more gasoline than they would have without the intervention. Then to make matters worse, the gasoline product- and service-providers had no motivation to increase the supply to meet the demand. If the government capped the price of cars at $1,000, there would soon be a “car shortage.” After all, why wouldn’t consumers buy a few extra cars since they are so cheap and are going fast and if you don’t buy one soon, they will all be sold out? Should the car manufacturers be blamed in such a scenario? Why would manufacturers ramp up production to meet the demand? I hope the answers are obvious enough. So now let’s return to the question posed earlier: How was the State of Freedom able to avoid the oil price shocks that the rest of the country suffered through? The simple answer is that they have a superior monetary system that is beyond the reach of government intervention. Their money remains stable and holds its value. G$.19 set aside 50 years ago still buys a loaf of bread today in Freedom. The commodity known as gold, as it always has, provides an unmatched ability to store value over time and space. That is why gold (and silver) has been elected to serve as money by the markets of the world for centuries. It is by far the best tool for the job. Oh well, enough daydreaming. If the State of Freedom doesn’t exist, then why waste time thinking about it? Back in '78, I was a greenhorn. Having just arrived, I really thought this was a free country. Then I had to "queue up" for a tank of gas, and knew something was badly out of whack. I searched high and low; Business Week, Time, Newsweek, NY Times, WSJ... I have an Econ degree but could not make head nor tail of what the experts were saying in explanation. Then the LP placed a full-page ad in one of them, offering a copy of the "Libertarian Review" for July/August 1979. Every word in that magazine made sense. 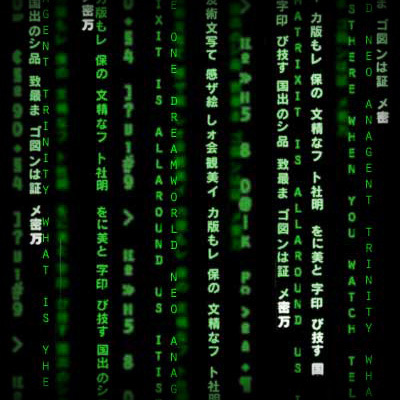 I have it in my hand now, as I type. The real cause of the gas lines was shown there to be just as you say. That got me started. So I owe the excitement of the last three decades to Richard Nixon, who imposed the price cap on oil - and to Jimmy Carter, who raised it. How can I repay them? You are the master tzo! I've carried a 1921 Morgan silver dollar since before 1950 -- I think I was around 14 when a now long-gone aunt gave it to me. In the late 40's in Texas that silver dollar would buy around 10 gallons of gasoline. Today that same silver dollar (were I to accept an average offer of 35 or so frn's for it) will still buy around 10 gallons of gasoline. Faith that predators organized as "government" will not steal. Faith that "Our-Forefathers" were not robbers. Faith in Our-Great-Nation and those perceived rulers who are trying once again to take our children into one of their wars to divert our attention from truth and keep us clapping and cheering and shouting nationalistic songs and slogans. Faith that those smiling, waving gangsters now filling the airways and coliseums in attempt to garner your "vote" this fall will continue to be seen as legitimate stewards of your productive capabilities.